Vikings defensive end Jared Allen paid a huge compliment to the Lions offense this week. While a few other opponents have claimed the Lions play dirty, Allen doesn’t see it that way. He sees the Lions as a tough hard-nosed opponent and knows he’s in for a fist-fight going up against the Lions. “I think we don’t want to be known as anything other than a team that plays hard and a team that plays physical football. I’m sure they’re the same way,’’ Lions coach Jim Schwartz said. “When that’s the way you want to play, when you see someone else that’s playing that way, you have respect for that. We have a lot of respect for Jared Allen and the things that defense has done. “That defense has been outstanding this year. They put one of the best efforts of the year together against Philadelphia. I’m sure they’re going to want to continue that. We’re going to need to meet that challenge. Our offense has met a lot of challenges. That’s a big part of this game." The Lions are looking to extend their win streak with a win over the Vikings on Sunday. ALLEN PARK -- The Lions have sold out their final game of the season to lift the local television blackout. They will face the Minnesota Vikings (6-9) at 1 p.m. at Ford Field on Sunday. They sold out seven of eight games this season to mark the most sellouts by the team since the 2007 season when all eight games were sold out. The game will air on WJBK-TV FOX 2 with Ron Pitts and John Lynch handling the call and Jennifer Hammond reporting from the sideline. 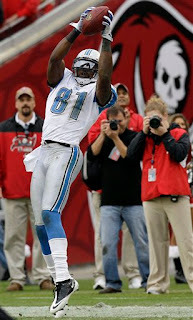 ALLEN PARK -- Lions wide receiver Calvin Johnson and cornerback Chris Houston did not practice today (Thursday). It’s the second straight day that each of the starters has missed practice. Johnson re-injured his ankle in Sunday’s win at Miami. It’s a possibility he could play on Sunday against the Vikings at Ford Field even if he does not practice all week. Houston injured his shoulder on Sunday and has not been ruled out to play the Vikings. LB Landon Johnson (concussion) is out and was expected to be placed on injured reserve. But that has not happened yet. Cornerback Tye Hill who missed Wednesday’s practice with an illness was back at it today. ALLEN PARK -- Vikings quarterback Brett Favre failed one concussion test but will take another today or Friday to see if he’ll be cleared to play the Lions on Sunday at Ford Field. Frazier said it will be determined today when Favre will take his next concussion test. The Vikings coach said he could take a test as late as Saturday and still be cleared to play. Lions coach Jim Schwartz said on Wednesday the Lions are preparing for both Favre and Joe Webb who started on Tuesday night at Philadelphia. The 41-year-old Favre suffered a concussion two weeks ago on the frozen field of the University of Minnesota stadium where the Vikings were forced to play after the roof of the Metrodome collapsed. If he plays it could be the final NFL game for Favre who holds the NFL record in every significant passing category including 508 touchdown passes and 71,838 career passing yards. ALLEN PARK -- Dominic Raiola claims he’s a hot head but a controlled hot head all the same. Raiola was fined $15,000 by the team according to unconfirmed reports. “I got fined, I got disciplined, I need to conduct myself better,’’ Raiola said on Wednesday. He does not agree with the theory that players are paid to take that kind of abuse from fans. ALLEN PARK -- Lions Pro Bowl starter Calvin Johnson did not practice today (Wednesday). He aggravated the ankle in Sunday’s win at Miami. Two more starters -- CB Chris Houston (shoulder) and LB Landon Johnson -- also did not practice. Both were also injured in the win over the Dolphins. Cornerback Tye Hill was not on the practice field either. It appears quarterback Shaun Hill will be the starter in Sunday’s season finale against the Vikings at Ford Field. Hill took reps at practice today (Wednesday) with the offensive starters. Most NFL rookie defensive tackles find it takes a few seasons to adjust to the rigors of the NFL. Lions’ defensive tackle Ndamukong Suh is not most rookies. Suh was recognized for his strong rookie season by being named to the Pro Bowl when the announcement was made Tuesday night. He will be joined as a Pro Bowl starter by Lions wide receiver Calvin Johnson who will make his first trip to the Pro Bowl as a starter. He was a Pro Bowl alternate last year. Johnson has rewritten the Lions’ record books this season. In the first 15 games he has a dozen touchdowns and 1,120 receiving yards. It’s the second time in four seasons in Detroit he’s gone over the 1,100-yard mark. On Sunday in the win over the Dolphins, Johnson recorded just the third season in Lions’ history with at least 75 receptions, 1,100 yards and 10 touchdowns and the first one to do it twice. The only other Lion to accomplish the feat was Herman Moore in 1994. Suh was taken with the second overall pick in April’s draft out of Nebraska. The Lions have never second-guessed themselves. Their expectations were high and he has not let them down. He was a hit from the first preseason game when he was double-teamed by the Steelers. His learning curve was substantially lower than most rookie defensive linemen. There are a few reasons. "First, where he was when he came in, I mean, he was a pretty good player to start with. So it wasn’t like he was a player that needed development,’’ Lions coach Jim Schwartz said. “There were a lot of things that he needed to do differently that he didn’t do in college. He was a read player in college, we turned him into an attack player. He adjusted pretty early to that, even though early in the season he still had a tendency at times to go back. But you’re talking about a guy that was very productive in college, had a long college career and history of production,’’ Schwartz added. In his first 15 NFL games he’s accumulated nine sacks which is tops among rookie defensive linemen and also leads all defensive tackles in sacks. 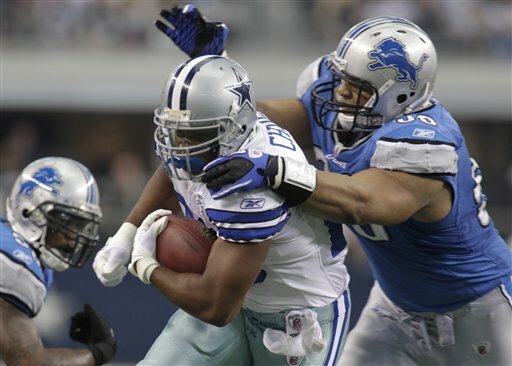 Suh also leads all rookie defensive linemen with 60 tackles. The next closest is Dan Williams who plays for Arizona with 37. For Suh, there he has not hit a rookie wall, instead he seems to have scaled it. "It’s a long season – something you’re not used to. You need to be able to persevere through a lot of different situations and there were some things that came up this year that he needed to persevere through and he needed to be able to adjust,’’ Schwartz said. “Seeing different attention with different blocking schemes and stuff like that, but found a way to be productive and could be even more productive – missed a sack late in the game which would have put him at the 10 mark, which would have been big for him." When he reached nine sacks during Sunday’s win at Miami he tied for the third-most sacks in a single Lions season by a defensive tackle with Jerry Ball who had nine in 1982. If Suh gets one sack in Sunday’s game against the Vikings, he will become the first rookie defensive lineman in the NFL since Bears DE Mark Anderson (12 in 2006) to record 10 sacks in a season. If he reaches the magic number 10 he will become just the fifth rookie defensive tackle to reach 10 since 1982. 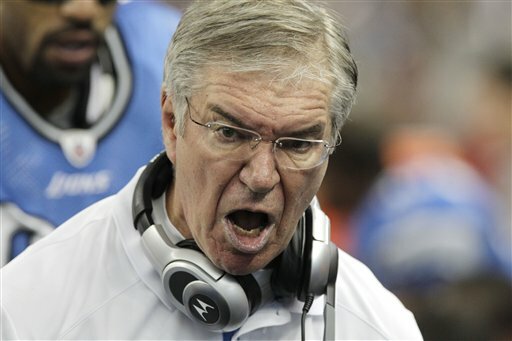 No wonder he has become a fan favorite at Ford Field. It could be the first of many Pro Bowl trips as a starter for Suh and Johnson. After Sunday’s win at Miami the Lions flew home, the players had Monday off and the coaching staff started to make plans to play the Vikings on Sunday at Ford Field in the season finale. So it would appear that the Lions (5-10) have a clear advantage over the Vikings (5-9) whose game at Philadelphia was delayed until Tuesday night because of the East Coast blizzard. You might think that, but Jim Schwartz sees it a little differently. “There’s a lot of teams that play (with only) four days (in-between games). We play Thanksgiving every year on four days, so it’s not a situation you can’t get ready for. I think both teams are familiar with each other. If anything, you can argue that it would favor them a little bit because we would have less time to prepare for their quarterback situation, whatever it is. We really won’t know as we move on until much later in the week,’’ Schwartz said. On Monday the Lions started with their plan against the Vikings, but usually they would have Sunday’s game film to aid them. But the quarterback is one of the big questions for the Vikings. Brett Favre has a concussion and is not expected to play Tuesday night. Instead Joe Webb could get the nod. ”It doesn’t do a lot of good to look at Tarvaris Jackson – he’s on injured reserve. Whether Brett Favre plays or not, whether it’s Webb, Patrick Ramsay – all those things are question marks and I think, from a preparation standpoint, in a strange sort of way it may actually favor them,’’ Schwartz said. “But from a physical standpoint, it should favor us. They’re playing on Tuesday; they’ll be on a short week and also travel here, so I think those things do work in our advantage,’’ the coach added. The Vikings are coming off a 21-3 loss to the Giants at Ford Field on Dec. 14 and a 40-14 smacking by the Bears on Dec. 20. Both games were delayed because of snow which makes it three weeks in a row of snow-delayed games for the Vikings. Schwartz can spin it anyway he wants. The Lions will be rested, ready and in good spirits because they have a chance to win four straight to end the season at 6-10. 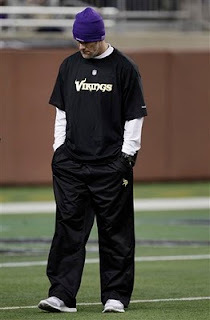 The Vikings, distracted for most of the season by Favre, will be snow-weary and likely coming off three straight losses. ALLEN PARK -- Of the three Lions injured in the win at Miami on Sunday, linebacker Landon Johnson seems the least likely to play this Sunday against the Vikings according to coach Jim Schwartz. Johnson suffered a concussion, a problem he has had previously. Bobby Carpenter stepped in for Johnson and finished with a team-high nine tackles. Schwartz also said the progress of CB Chris Houston (shoulder) and WR Calvin Johnson (ankle) will be watched through the week of practice. Johnson practiced on a limited basis last week because of his ankle injury and still started on Sunday. In his first start since Thanksgiving, Shaun Hill played well in the win, but Schwartz will wait until later in the week to name a starter for Sunday. MIAMI GARDENS -- What you have witnessed in the last three games -- all wins for the Detroit Lions -- is a team that is growing up and learning how to win. It sounds simple, but it has been a process that was horribly painful and even grotesquely ugly at times. After the 34-27 comeback win over the Miami Dolphins on Sunday, big Lions fan Kid Rock ran into the locker whooping and hollering. He was screaming out for Lions fans everywhere who are happy to see this long-struggling bunch start a turn-around with three straight wins -- two of them on the road. On Sunday it was definitely about perseverance and the two key play makers -- rookie Jahvid Best and DeAndre Levy -- personified that. Both have been bothered with injuries all season -- Best has turf toes, Levy a bothersome groin. Yet when they had to come up big they did. Down 27-17 with 4:37 left in the game, the Lions scored 17 points in 2 minutes and 26 seconds. Best and Levy each had a touchdown. While Dave Rayner came up big with a 47-yard field goal in-between. On a first-and-10 from Detroit’s 47, quarterback Shaun Hill, who got the start over Drew Stanton, connected with a wide-open Best for a 53-yard score. “I’m not exactly sure what they ran, but whether somebody lost him in man-to-man or he was able to sneak out in zone, he’s a guy if you get the ball to him in the open field he can make a play,’’ coach Jim Schwartz said of Best. “... When he got in the guy’s hip pocket, it was Nate (Burleson) that was down there blocking ahead of him, a lot of people get tackled there or get too impatient, he just sort of got in a convoy and made a nice play,’’ Schwartz added. Burleson was blocking cornerback Vontae Davis to allow Best to run into the end zone. With that touchdown the Lions were down 27-24. When the Dolphins got possession back, cornerback Nathan Vasher stepped in on a third-and-11 and intercepted Chad Henne at Miami’s 36-yard line. The Lions settled for a field goal to tie the game. On the Dolphin’s third snap after getting the ball back, Henne’s pass for Davone Bess was intercepted by Levy at Miami’s 30 and run back for a game-winning touchdown. It was not an easy return. It wasn’t 30 yards north and south, it was several more east and west. Clearly scoring was Levy’s goal. The defense knew it had to make a play. And then he did. It was a sign of maturation for the defense. It was the third straight win and all have been tight -- last Sunday 23-20 in overtime at Tampa, the week before that 7-3 over Green Bay. The Lions were down 17-10 at the half after a 20-yard Brandon Pettigrew touchdown catch and a 39-yard Rayner field goal. The wind was a factor, but the Lions were able to overcome that too. Schwartz said they wanted to just hold on in the third quarter when the Dolphins had the wind and then make something happen in the fourth. Good plan, better execution. Burleson said he almost got blown off the line of scrimmage at one point, it was that windy. He credited Hill (14 of 26 for 222 yards, two touchdowns, 0 interceptions) for keeping the offense moving and offensive coordinator Scott Linehan for calling the plays to make it work. Burleson, in his first season with the Lions, has fought through the team growing pains. “It’s learning from your mistakes, it’s a maturity and not being surprised that we’re good -- not great -- we’re not the best team in the NFL but not being surprised that we’re good,’’ Burleson said. “We’re a good team. I think earlier in the season at times we panicked and freaked out when we were in games and started to make mistake after mistake and we’re not doing that same thing. We’re a different team,’’ he added. And now it shows where it counts -- on the scoreboard. Paula Pasche covers the Lions. Follow her on Twitter @PaulaPasche. Read her Lions Lowdown blog at TheOaklandPress.com. MIAMI GARDENS -- Quarterback Shaun Hill will start for the Lions today against the Dolphins. It’s his first start since he broke a knuckle on his index finger of his right/throwing hand on Thanksgiving. Drew Stanton, who has won two straight as a starter, will back him up. Stanton injured his left shoulder last week in the win at Tampa. C.C. Brown will start at safety in place of Louis Delmas, who sustained a concussion last Sunday at Tampa and is out. This is not a surprise. He was listed as doubtful on the injury report. Matthew Stafford (shoulder) was put on injured reserve on Friday. Other inactives: RB Aaron Breown, DE Barry Turner, T Tony Ugoh, G Donald Thomas and DE Willie Young. If the Lions want to start a road winning streak, here are five things they must accomplish to beat the Dolphins. 1. Give the ball to Maurice Morris, open up the holes and let him run. This is why the Lions have won two straight, keep it going. 2. The offensive line has been solid most of the year, but they were really fired up last week. They need to play with the same intensity. 3. Again the defense will be counting on the line to apply pressure on quarterback Chad Henne. This is even more crucial with the injuries on the back end. S Louis Delmas is doubtful due to a concussion. 4. The Dolphins count on their defense (ranked fourth in NFL) to win because their offense can’t score points (239 all season). Only the Panthers have scored less with 183. 5. Lions again must keep turnovers to a minimum. In a move that is hardly surprising, the Lions placed quarterback Matthew Stafford on injured reserve today. 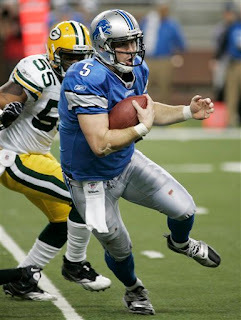 Stafford has not played since injuring his right/throwing shoulder in the game against the N.Y. Jets on Nov. 7. He started just three games this season. In the first half of the opener at Chicago he injured that same shoulder and was out for six weeks. Safety Randy Phillips was activated from the practice squad to take Stafford’s roster spot. Either Shaun Hill (broken finger) or Drew Stanton (left shoulder) will start on Sunday. Both are listed as questionable on Friday’s injury report. Also on the injury report, S Louis Delmas (concussion) is listed as doubtful. LB Landon Johnson (neck) is also questionable. DE Cliff Avril (rib), RB Jahvid Best (toe), LB Vinny Ciurciu (concussion), DE Lawrence Jackson (groin), WR Calvin Johnson (ankle), DE Turk McBride (ankle), RB Maurice Morris (chest) and S Amari Spievey (back) are probable. ALLEN PARK -- Lions defensive coordinator Gunther Cunningham thought safety John Wendling played well last Sunday in the win at Tampa. It was more impressive considering it was the first time Wendling had ever taken snaps on defense in an NFL game. Usually he’s a gunner on special teams. Cunningham said two of his plays stood out. "One was a motion play that he made the check on and rolled back to the deep middle, I couldn’t believe it. He moved before anybody on our defense; he knew exactly what to do. The other one was a power play where the fullback came after him and I think the fullback is still talking to himself because John’s about 220, 225,’’ Cunningham said. “I don’t know if you know this, but he is really fast. That’s why he’s a gunner on this team. I’ve heard rumors about how fast – I’m not going to give you a number. For me, I don’t believe it." Wendling said he ran a 4.48 at the NFL combine but on his junior pro day he clocked 4.38. He was a sixth-round pick by Buffalo in the 2007 draft out of Wyoming. On Sunday Wendling got the nod to play after Louis Delmas suffered a concussion in the first quarter against the Bucs. Amari Spievey, the other starter was ruled out after pre-game warmups, so C.C. Brown got the start for him. “I’m glad it worked out the way it was, I had C.C. out there to help me out a little bit, it was a good group of guys to play with,’’ Wendling said. His biggest play this season was the most unusual of the season. It was in Dallas when Wendling jumped up to knock a punt down so it wouldn’t go into the end zone. Instead it went directly into the hands of Dallas’ Bryan McCann who ran it back 97 yards for a touchdown. ALLEN PARK -- Quarterbacks Shaun Hill and Drew Stanton appeared to share reps with the first-string offense in practice today (Thursday). Hill took reps with the starters on Wednesday, but coach Jim Schwartz said he won’t announce the starter prior to Sunday’s game at the Miami Dolphins. Hill broke the top knuckle of the index finger of his throwing hand on Thanksgiving. He started throwing and taking hard snaps last week. He’s playing with a small splint taped to his finger and has had to adjust his grip and throwing motion. Stanton is dealing with a shoulder injury of his non-throwing arm which he said on Wednesday had been feeling better each day. Matthew Stafford was ruled out of the picture by Schwartz on Wednesday. Four players who had missed practice on Wednesday -- Calvin Johnson (ankle), Maurice Morris (chest), Lawrence Jackson (groin) and Cliff Avril (rib) were back at it on Thursday. Louis Delmas (concussion) did not practice. 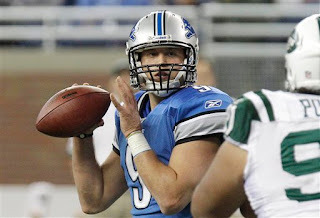 ALLEN PARK -- Matthew Stafford is not in the picture for Sunday’s game at Miami. Lions coach Jim Schwartz made the announcement after practice today (Wednesday). Shaun Hill (broken finger) took snaps with the first-string offense at practice with Drew Stanton (shoulder) as the No. 2 quarterback. Schwartz would not name a starter for Sunday. “We’ll have a good idea as the week goes on what the health of our guys are and who we’re going to go with on Sunday, but we probably won’t announce it until we get to game time, simply for competitive reasons because those guys are different and require different game plans,’’ Schwartz said. Stafford injured his shoulder on Nov. 7 against the Jets and has not played since. He did not practice on Wednesday. The team has never set a timetable for Stafford’s return and he has not been eliminated from consideration to play in the final game on Jan. 1. “... If we get him back that would be good. If not we’ll cross that bridge when we get to it. Obviously as you get closer to the end it changes your thought a little bit, but we’re probably not at that spot just yet,’’ Schwartz said. ALLEN PARK -- The Lions’ top offensive producers -- WR Calvin Johnson and RB Maurice Morris (ribs) -- did not practice today (Wednesday). It’s likely Johnson was given a day to rest. Morris injured his ribs in the win at Tampa. Also sitting out practice were Louis Delmas (concussion), Lawrence Jackson, Cliff Avril (ribs), Derrick Williams and Matthew Stafford. Linebackers Landon Johnson (neck) and Vinny Ciurciu (concussion) were back at practice after missing Sunday’s game. QB Shaun Hill took reps with the starters while Drew Stanton was the backup. Matthew Stafford was nowhere in sight. ALLEN PARK -- Shaun Hill took reps with the starters in practice today (Wednesday) which is an indication he will be the starter on Sunday in Miami. It’s not a sure thing, but it definitely makes him the favorite. Coach Jim Schwartz will address the situation when he talks to the media following practice. Although he won’t necessarily name a starter. Drew Stanton, who injured his left shoulder in the first half of Sunday’s 23-20 overtime win at Tampa, was the No. 2 quarterback in practice. He has won two straight games. Hill broke a knuckle on the index finger of his throwing hand during the Thanksgiving loss to the Patriots. He started throwing at practice last week and was listed as the backup for Sunday’s game against the Bucs. Matthew Stafford sprained his throwing shoulder in the loss to the Jets on Nov. 7 and has been out ever since. Stafford did some light throwing two weeks ago in practice and has not been seen throwing again. He was not at practice, but that is not unusual. Offensive linemen get called out regularly when they noticeably screw up, but usually don’t get much credit when they play well. Coach Jim Schwartz gives them credit for helping to allow so few quarterback sacks (24) this season. “It all ties together. Our quarterbacks have done a good job of moving around in there, escaping and getting rid of the ball; Drew (Stanton) had one of those situations where it looked like he was going to take a sack and he was able to shuttle it out to Maurice Morris on one to get an incomplete pass,’’ Schwartz said. “So I think all of those sort of tie together, but our offensive line has done a really good job of protecting the quarterback. You can’t do that if he doesn’t have places to go with the ball and he had a lot of places to go with the ball in this last game,’’ the coach added. The line, in particular center Dominic Raiola, were extra fired up against the Bucs after Tampa Bay coach Raheem Morris slapped them in a face with a comment he made about who he was going to play on the defensive line. Rob Sims has fit right in at left guard between Raiola and Jeff Backus. Stephen Peterman has somehow played through despite a foot injury. Corey Hilliard has stepped up at right tackle with Gosder Cherilus gone for the season and done a solid job. Hilliard was one-on-one with Green Bay’s Clay Matthews and kept him quiet the whole game two weeks ago. Not only has the line allowed few sacks, they have opened up holes for the running game especially in the past few games. ALLEN PARK -- It seems that Drew Stanton has earned the right to a third start on Sunday in Miami, but there are several variables involved in the decision. Lions coach Jim Schwartz said on Monday that he is in no hurry to name a starting quarterback for Sunday. The coach said it’s possible the decision will not be announced until Sunday. Stanton has picked up two straight wins as the starter, but suffered a shoulder injury at Tampa. Schwartz wouldn’t give details on the injury, but said it could be a factor. Shaun Hill broke a knuckle in his index finger of his throwing hand on Thanksgiving and was the backup on Sunday. He practiced last week on a limited basis. Matthew Stafford has been out six weeks with his second shoulder injury of the season. In Sunday’s pre-game warm-ups he was careful to not even toss the ball with his right arm. TAMPA -- It was all about attitude for the Lions on Sunday. They did not play like a team that had won only three games, they played like they meant it -- for 60 minutes and then some. “We had a killer instinct on offense today, a truly different attitude out there today ...’’ wide receiver Calvin Johnson said. “I think it’s the week of practice, coming off a win. That breeds a lot of confidence and we carried it down here.’’ With the 23-20 overtime win over the Tampa Bay Buccaneers on Sunday, the Lions (4-10) have now won two straight games for the first time since 2007. That, however, is not the streak of importance. With the huge win on Sunday -- the result of back-to-back drives ending in field goals -- the Lions finally snapped their NFL record 26-game road losing streak that began in October 2007. It was a huge win for this franchise and for the Jim Schwartz era. It could be the game that gets them over that hump that has been holding them back. And now that ugly streak is history. Raiola was totally fired up for the win and the inspiration the offensive line received from Buccaneers coach Raheem Morris. On Friday when Morris was asked how he planned to replace defensive tackle Gerald McCoy he took a swipe at the Lions. "It will all depend on what (the Lions) do and what I want to do and how I want to force my will on our opponent that day," Morris said, as reported in the Tampa Tribune. “That’s like a slap in your face. ... I’ll tell you right now I’m fired up, we’re not going to be monks any more right now, you saw the film you saw how violent it was,’’ Raiola said. It was part of the fire that burned within the Lions’ offense which apparently spread to defense and special teams. While the emotions were high they were in control especially for quarterback Drew Stanton who picked up his second straight win in just his fourth NFL start. All he had to do was lead the offense on two field-goal drives -- one at the end of the game with no timeouts and the other in overtime after Detroit won the OT coin toss. With 1:39 left on the clock and the Bucs up 20-17, Stanton started the fourth-quarter drive on Detroit’s own 32. Stanton was four of eight with key passes to Calvin Johnson for 23 yards on a second-and-six, a 19-yard pass to Bryant Johnson on second-and-10 and a 12-yarder to Tony Scheffler on a third-and-10. Then Dave Rayner (Michigan State and Oxford High) stepped in and kicked a 28-yard field goal to tie the game with no time left. After winning the toss, the Lions started on their own 21 with a 26-yard run by Maurice Morris, followed by a 14-yard scamper by Jahvid Best. On a third-and-8 at Tampa’s 37 Stanton threw to Calvin Johnson who ran out of bounds at the Tampa 25 with a 12-yard gain. Stanton never saw Johnson made the catch that secured the win. “I knew they were going to bring an internal blitz so I have to sit in here and take this one and trust he’s going to get to his spot, I still haven’t seen it. I’m sure he made an unbelievable catch,’’ said Stanton who was 23 of 37 for 252 yards, one touchdown and 0 interceptions. 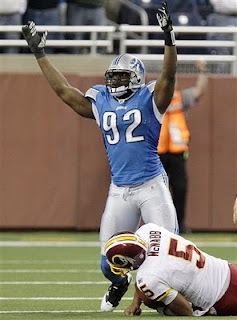 Even though it was the key play in the win, Calvin Johnson aw-shucked it. “It was a simple route, it just happened to be in a good situation, it was a good ball for me to snag,’’ Johnson said. And he was able to keep his feet in. Rayner, who has stepped in for the ailing Jason Hanson, stepped in and kicked a 34-yard field goal to win the game. It was a team win in every way. Stanton, Calvin Johnson (10 catches 152 yards), the running game featuring Maurice Morris with 15 carries for 109 yards and a 10-yard touchdown run, Rayner’s two field goals (28 yards and 34 yards), the offensive line that opened up holes for the running game. Nate Burleson opened the scoring with a 10-yard touchdown catch in the first quarter. And, of course, the defense which gave up 403 yards of offense, but didn’t allow the Bucs to score on two red zone opportunities. And so have the Buccaneers (8-6) who entered the game with five fourth-quarter comebacks and the odd record of not having beat a team with a winning record. It was a huge step for the Lions who were finally looking forward to the plane ride home. “It’s a big relief, finally get to take a plane ride with smiles and laughter and all that good stuff, instead of going back all sad and everybody mad,’’ defensive tackle Corey Williams said. This win won’t mean as much if the Lions don’t follow it up with another solid effort next Sunday at the Miami Dolphins. It was a sign that this bunch of talented, yet very banged up players, is on the right path. It’s been tough, but what doesn’t kill you makes you stronger and these Lions are living proof. 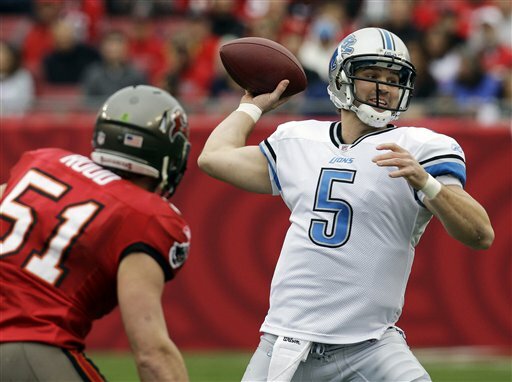 TAMPA -- As expected Drew Stanton will start today for the Lions against the Buccaneers. Shaun Hill will serve as the backup. Zac Robinson is listed as the third quarterback. Matthew Stafford (shoulder) will miss his sixth straight start with this injury. He was on the field in pre-game warmups messing around with the other quarterbacks and throwing left-handed. Didn’t see a right-handed throw. Also inactive today are RB Aaron Brown, T Tony Ugoh, G Donald Thomas, DE Willie Young. Corey Hilliard will start at right tackle instead of Gosder Cherilus who was placed on injured reserve. Bobby Carpenter will start at outside linebacker for Landon Johnson (neck). LB Vinny Ciurciu (concussion) did not make the trip. It’s cool and drizzly at Raymond James Stadium. ALLEN PARK -- Even after undergoing surgery last week on a bulging disc in his neck, Lions defensive end Kyle Vanden Bosch has still had a huge impact on his teammates. He’s done for the season, but he’s not done with his work. His impact has been all-encompassing. Defensive coordinator Gunther Cunningham said he finally got defensive end Turk McBride to tell him how he had improved so much this season. “I said, ‘You were at Kansas City with some veterans. Vanden Bosch was injured in the Thanksgiving game and had surgery last week and was placed on injured reserve. “I’ve met some tough people in my lifetime, but never one like Kyle. For him to show up right after that surgery and be on the sideline (on Sunday), he’s in the meeting rooms. ... Just talking to him makes you feel better. What a great thing for the young guys to be around,’’ Cunningham said. McBride will finish out the season in Vanden Bosch’s spot on the right end. ALLEN PARK -- Lions starting right tackle Gosder Cherilus wanted to finish what he had started, but knee surgery ended his season with three games remaining. “As Gos has played through some injuries over the course of his career, his knee got to the point that he couldn't keep going. He needed surgery. It was time for him to go get it rather than to make a matter worse,’’ coach Jim Schwartz said on Thursday. “But we're looking for a good recovery for him. Obviously he goes on the injured reserve, not able to finish this season. That was something that meant a lot to him, but it was just something he couldn't physically do. He'll be back. But no ligament issues or anything like that. But he'll be back for us. He just had a scope." Schwartz would not be more specific about the injury. But he was ready to praise Cherilus who was in his third season with Detroit. Cherilus won the starting job over veteran Jon Jansen during training camp. ALLEN PARK -- For the second day, Lions QB Shaun Hill threw lightly during practice. But it was Drew Stanton who was taking snaps with the starters. Hill broke a knuckle in the index finger of his throwing hand on Thanksgiving and has not played since. It is unlikely that coach Jim Schwartz will reveal the starter for Sunday’s game at Tampa Bay later today. Matthew Stafford was not on the field during the early part of practice which is open to the media. Linebackers Vinnie Ciurciu (concussion) and Landon Johnson (neck) did not practice for the second straight day. With both of the linebackers out, Bobby Carpenter was taking snaps with starters DeAndre Levy and Julian Peterson. CB Chris Houston, who was out with an illness on Wednesday, was back in action. The final roster spot, which was created when RT Gosder Cherilus was placed on injured reserve on Wednesday, was filled when the Lions re-signed CB Eric King who had been with the Lions in training camp. He was cut by the Cleveland Browns this week. 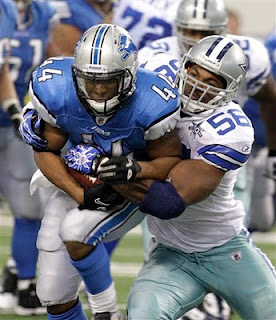 If the defensive line was not the strength of the Lions, there would be something wrong. After all they added Kyle Vanden Bosch, Corey Williams and Ndamukong Suh in the offseason. No one has disappointed. In fact, Suh has delivered more than some expected for a rookie. With Vanden Bosch out for the season and Cliff Avril banged up with rib injuries, others have stepped up big time. While the big names are key, it’s the depth of the defensive line that makes it special. Turk McBride has started for Vanden Bosch and Avril at times. His five sacks to date are a career high. In fact in his first three seasons in the NFL, he had 5.5 combined. Lawrence Jackson, a former first-round pick, has stepped up after being acquired during training camp. A hamstring injury kept him from jumping in at full speed, but he’s been impressive with 4.5 sacks in eight games. Let’s not leave out Sammie Hill, a starter last year, who is much improved this season, and Andre Fluellen. Suh, Williams and Vanden Bosch are the faces of the defensive line. But it’s the depth that makes it special. Is winning on the road the next step for Lions? The Lions lucked out with the schedule makers in one way. Their final two road games will be played Sunday in Tampa and Dec. 26 in Miami. It beats Buffalo. Still, they have got to prove they can win on the road. You know the story they hold the NFL record for consecutive losses at 26 straight. Is that the next step to show progress? “Winning on the road is something that we need to do as a football team. One win isn’t going to change that, you know what I mean? One win isn’t going to say, ‘You know you get one win and all of a sudden we’re going to be undefeated on the road for the next decade.’ That’s not going to happen, but it would be a step and it’s something that we need to accomplish,’’ coach Jim Schwartz said. “Good football teams win on the road and we aspire to be a good football team." DETROIT -- It was a historic moment at Ford Field tonight when Vikings quarterback Brett Favre did not start Monday night, breaking his string of 297 straight starts dating back to Sept. 27, 1992. Lions coach Jim Schwartz, a Baltimore native, is well aware of sports streaks such as one involving Cal Ripken. “Football is a completely different sport, playing the quarterback position you have a ... everybody kids them because they wear red shirts on practice days but they may as well have a red shirt on Sunday as far as being a target because everybody is going to go after them,’’ Schwartz said. Favre was at Ford Field, but could not play because of a sprain on his throwing shoulder. It is unknown if he’ll be back for the final three games of the season. Schwartz said he’d been around a lot of tough quarterbacks including Steve McNair. “It hasn’t been that he’s been healthy that entire streak, it’s that he’s been able to play with the injuries that he’s had. That speaks to his toughness, his body, his ability to get out there and his longevity,’’ Schwartz said. DETROIT -- All season, well actually for many seasons, the Lions have talked about how they were one play away from a win. On Sunday, the football gods smiled on the struggling Lions franchise. Detroit quarterback Drew Stanton threw a pair of interceptions, half-a-dozen flags were thrown the Lions way and they punted eight times, but no questionable flags were thrown. When the Lions needed the big play they made it on both sides of the ball. Let that digest, because this is all new for Lions fans. In one of the ugliest NFL games you might ever witness, the Lions beat the Green Bay Packers 7-3 in front of a sold-out Ford Field crowd on Sunday. It was a huge win in many ways. It snapped the Lions’ five-game losing streak, ended the Packers’ streak of 10 straight wins against Detroit and, here’s a big one, the Lions had not beaten a division opponent for 19 straight games. The defense played its most consistent game of the season. They held the Packers scoreless while starting quarterback Aaron Rodgers was in. After he left with a concussion, they only allowed a 42-yard field goal. The biggest defensive play was with 1:03 left when the Packers went for it on fourth-and-one from the Detroit 31. Backup quarterback Matt Flynn found Greg Jennings in the end zone in single coverage and heaved the ball in his direction. But with good coverage from Detroit cornerback Nathan Vasher, it was incomplete. “I just had to come up and make a play, so it felt really good,’’ Vasher said. He knew a flag had not been thrown because he could see the referee standing right there. That was the key play in the game, the play that often the opponent would have found a way to make work, but not on Sunday. “We have been in situations like that it seems like throughout the season, feeling really good about ourselves at half-time then coming out and basically kind of laying an egg a little bit,’’ Vasher said. “Guys were looking at each other eye to eye, we were saying to each other we’re going to finish out the game and 10 minutes left in the game, eight minutes, two minutes we were basically talking about the situations and stuff. I think that’s something we can build on,’’ Vasher added. Lions quarterback Drew Stanton, in his second straight start, looked horrid in the first three quarters and he knew it. “Everybody was there watching that, it was a struggle at first, it was a struggle for me to find my rhythm, and as a quarterback you have to keep grinding, keep working through it and find ways,’’ Stanton said. He was 10 of 22 for 117 yards with two interceptions and one touchdown. But all they needed was that one touchdown, a 13-year tight end screen pass to Will Heller midway through the fourth quarter. The Lions had called that same play last week to Brandon Pettigrew against the Bears and it didn’t work. “At times I might have gotten a little greedy doing stuff and trying to do other things, I had to reel it in and play to my strengths,’’ Stanton said. “You have to take your hat off to the defense they played unbelievable, they answered the bell every single time,’’ Stanton said. The Packers, who had won five of their last six, finished with just 66 rushing yards and 223 passing. For the Lions, it’s a win. Ugly does not matter. “Any way you can get a win, that’s all it’s about. Whether it’s a blowout, like we’ve done before, or it’s a tough dogfight like we just went through,’’ said Lions defensive tackle Ndamukong Suh. DETROIT -- Ford Field finally gets a Monday night game, but it has nothing to do with the Lions. According to sources, Ford Field has been chosen to host the N.Y. Giants vs. Minnesota Vikings game on Monday night. Kickoff is 7:20 p.m. The game was forced to be moved after snow collapsed the roof of the Metrodome. The NFL looked at other locations including Lucas Oil Stadium in Indianapolis. Stay tuned for more details, including the ticket situation. Could be some good deals involved, haven't heard anything official on that yet. The Lions are preparing to kick off against the Green Bay Packers. Rich Eisen is reporting that the Giants-Vikings game will "likely" be played at Ford Field on Monday night. The game, which was set for today at Minneapolis' Metrodome, had to be moved because the roof collapsed under the weight of snow. Lions' vice president Bill Keenist released this statement: "We understand the league is considering all its options. We have let the league know that we are willing to help in any way." Big question is how would they get fans into Ford Field. They wouldn't play in front of empty seats. DETROIT -- Lions' starting right tackle Gosder Cherilus (knee) is out for today's game vs. the Packers. Corey Hilliard will get the start in his place. No other surprises among the inactives. They include: QB Matthew Stafford, QB Shaun Hill, DE Barry Turner, G Donald Thomas, DE Willie Young and T Tony Ugoh. Remember Kyle Vanden Bosch, Alphonso Smith and Derrick Williams were put on IR this week. Key matchup: Packers QB Aaron Rodgers against the Lions’ secondary. Rodgers was held to 169 passing yards and was intercepted twice in their first game on Oct. 3. Since then the Lions’ secondary has been tweaked and re-tweaked yet still the Lions defense is 16th in the NFL against the pass and they allow 222 passing yards per game. History: The Lions lost a squeaker 28-26 at Lambeau Field in the fourth game of the season. The Packers ground down the clock after getting the ball with 6:32 left in the game to hold on for the win. ... The Lions are 2-7 against Green Bay at Ford Field. ... The Packers have won 10 straight over the Lions. Injury report: Lions -- QB Shaun Hill (right index finger), QB Matthew Stafford (right shoulder) and WR Derrick Williams (ankle/IR) are out. T Gosder Cherilus (knee) is doubtful and LB Isaiah Ekejiuba (knee) is questionable. DE Cliff Avril (quadricep), RB Jahvid Best (toe), WR Calvin Johnson (groin) and LB DeAndre Levy (groin) and WR Nate Burleson (hamstring) are probable. Packers -- RB Korey Hall (knee), DE Cullen Jenkins (calf) and CB Patrick Lee (ankle) are out. S Atari Bigby (hamstring) and T Anthony Smith (ankle) are questionable. T Chad Clifton (knees/concussion), S Nick Collins (shoulder), LB Clay Matthews (shin), WR Jordy Nelson (ankle), CB Charles Woodson (toe/ankle), WR Donald Driver (hand), DE Ryan Pickett (ankle) and WR Brett Swain (knee) are probable. Up next: Lions at Tampa Bay Bucaneers, 1 p.m., on Dec. 19. The Packers have won the last 10 matchups with the Lions, including the 28-26 win on Oct. 3 at Lambeau Field. Here are five things the Lions must do to have a chance to beat the Packers. 1. Limit the damage from quarterback Aaron Rodgers who has led the Packers to the sixth-best passing offense in the NFL. Don’t let him kill with the long bomb. 2. Run the ball. Last week the Lions were able to stay in the game against the Bears because they run the ball effectively. Jahvid Best had his best game since Week 2. 3. Quarterback Drew Stanton needs to stay the course. He was efficient and effective last week in part because he wasn’t intercepted. He should be more comfortable this week. 4. Get the ball to Calvin Johnson as often as possible. 5. Stay resilient. Don’t give the game away in the fourth quarter. Just saying. Much has been made this week of rookie Ndamukong Suh and his $15,000 fine for a questionable call on a tackle of Bears quarterback Jay Cutler. Suh has handled the situation as a true professional. But that is no surprise. 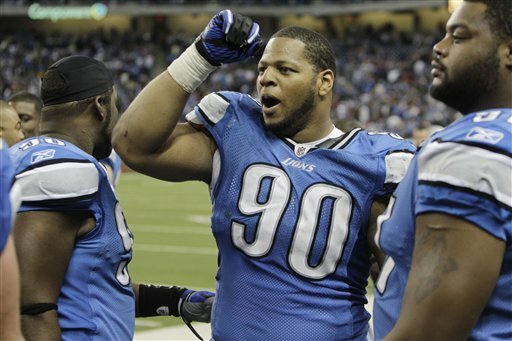 Much was expected of the Lions’ second overall draft pick and Suh has not let anyone down. Center Dominic Raiola said he thinks even more highly of Suh now. Defensive coordinator Gunther Cunningham said when he talks to Suh he feels like he’s talking to a Hall of Famer, not a rookie. "I talk with (Stephen) Peterman, Raiola and (Jeff) Backus a lot, we ride to work together when we play away and I get some real great insights. Peterman and all of them support Suh, and they should,’’ Cunningham said. “They really respect him. They think he’s a man’s man and his coach does too, Kris Kocurek (defensive line coach). I feel like I’m his grandfather, but that’s good." ALLEN PARK -- Ndamukong Suh wasn’t the only Lions’ defensive lineman hit with a $15,000 fine after the Bears game on Sunday. Defensive end Cliff Avril was fined $15,000 for roughing the passer -- Chicago’s Jay Cutler. Avril was called for the penalty in the second quarter. “I didn’t even hit him in the face, that’s the crazy part. I’m going to appeal mine also,’’ Avril said. Just like Suh, Avril said he can’t let it affect the way he plays. “It definitely hurts my pocket, I just go out there and try to play hard. You never want to get any fines or any penalties, but sometimes in the process of being physical you get them,’’ Avril said. It’s Avril’s first fine this season. Stafford threw for the first time on Wednesday and was expected back on the field today if his shoulder did not have an adverse reaction. Stafford injured his right/throwing shoulder on Nov. 7. The media is allowed to watch the first 30 minutes or so of practice and there was no sign of Stafford at all. After Wednesday’s practice Stafford did not seem too optimistic about a return this season. Drew Stanton has been named the starter for Sunday’s home game against the Packers. Also, defensive end Barry Turner (Nebraska), who was claimed off waivers from the Bears, practiced. RT Gosder Cherilus and WR Derrick Williams, who both practiced on Wednesday, were out today. ALLEN PARK -- With approximately 1,000 tickets left for Sunday’s game against the Green Bay Packers, it is likely the game will sell out and be televised locally. The deadline for the sellout is 1 p.m. on Thursday. Despite their 2-10 record, the Lion have sold out five of their six games at Ford Field this season. Their only two wins -- against the Rams and Redskins -- were home wins. Drew Stanton was announced today as the starting quarterback. ALLEN PARK -- What is going on here? Does the NFL have something against Lions defensive tackle Ndamukong Suh? The rookie has been fined $15,000 for his hit on Bears QB Jay Cutler on Sunday. Suh said he will make an appeal through his agent Roosevelt Barnes. Basically Suh pushed Cutler down with two outstretched arms while the quarterback was out of the pocket and scrambling. Referee Ed Hochuli later referred to it as “a non-football act.” Coach Jim Schwartz disputed the call during his Monday press conference and didn’t want to comment further today. Suh was fined $7,500 for his hit on Cleveland QB Jake Delhomme in a preseason contest. ALLEN PARK -- Lions QB Matthew Stafford threw at practice today (Wednesday) for the first time since he injured his right/throwing shoulder on Nov. 7 in the loss to the Jets. Stafford threw his first pass to WR Stefan Logan, about a 10-yards, as practice started. In case the media didn’t see it -- which we did -- center Dominic Raiola yelled to the media throng in the balcony to make sure it was witnessed. Stafford, who was wearing a ball cap instead of a helmet, threw about a dozen more short passes. His first shoulder injury in the opener on Sept. 12 kept him out of action for six weeks. If the time frame is the same -- and this is just speculation -- he could return on Dec. 19 at Tampa. Drew Stanton, last week’s starter, was taking reps with the starters. Shaun Hill (broken index finger) did not throw. Also CB Alphonso Smith, who injured his right shoulder in Sunday’s game, was placed on injured reserve meaning he’s done for the season. To take his roster spot the Lions signed CB Prince Miller off the Ravens’ practice squad. Should Lions extend Drew Stanton's contract? ALLEN PARK --- When a team has lost five straight, not to mention just four wins over the last two seasons, bright spots are tough to find. Well, the Detroit Lions found one on Sunday. Drew Stanton started his first game of the season and second of his career. He did not lead the team to a win, but he played well. Stanton showed great improvement over his only other start which was Dec. 27, 2009, in San Francisco. In that loss he threw three interceptions, lost a fumble and was benched in favor of Daunte Culpepper. This is what 11 more months under the tutelage of offensive coordinator Scott Linehan will do to a 26-year-old quarterback. Also he works closely day to day with Matthew Stafford and Shaun Hill. Even though it seems like Stanton has been around a while this is his fourth season. But in football terms it’s just his second due to injuries in his first two seasons that kept him out of action. Even though he’s a local guy -- Farmington Hills Harrison and Michigan State -- fans didn’t seem to have too much faith in him. Perhaps it was that awful outing last year. What fans think though is quite different from what the Lions coaching staff sees on a daily basis. Linehan and Schwartz both praised Stanton last season. They wouldn’t keep him around if they didn’t see something in him. This is Stanton’s final year of his contract. No one really knows if he’s in the Lions’ future plans. But if he plays well again on Sunday (it’s likely he’ll start against the Packers) perhaps they will decide he’s too valuable to let go. ALLEN PARK -- Lions defensive end Cliff Avril wants to know one thing: Is it possible to hit too hard? Referee Ed Hochuli apparently thinks the answer is yes. A day later the Lions were still shaking their heads over the botched call by Hochuli on Sunday in their loss to the Bears. Ndamukong Suh was penalized for pushing quarterback Jay Cutler down with both hands from behind. His hands were on Cutler’s back, not his helmet. Hochuli called it a “non-football act” and no one is exactly sure what that means. It’s the fourth personal foul called on Suh this season. The play was replayed several times during Monday’s defensive line meeting. Avril said their only advice for Suh is to keep hitting and playing hard. Perhaps the oddest admission after the Lions lost 24-20 to the Bears on Sunday, was that the Lions were prepared to play in a stadium at least half full of Chicago Bears fans. And it was Ford Field, their home. Quarterback Drew Stanton said they were ready to go to the silent count if necessary. That proves one thing, coach Jim Schwartz does prepare with every detail in mind. Like one of my Twitter followers said, he was thankful the game sold out, even if many of them were Bears fans, because that way the game was televised locally. It could be the same thing this Sunday when the Packers come into Ford Field. Of course, it’s a longer drive from Green Bay than Chicago. But it’s tougher to get a ticket to Lambeau than to Soldier Field. DETROIT -- Defensive end Kyle Vanden Bosch (neck) is out today against the Bears which is no surprise. He was listed as doubtful on Friday’s injury report. 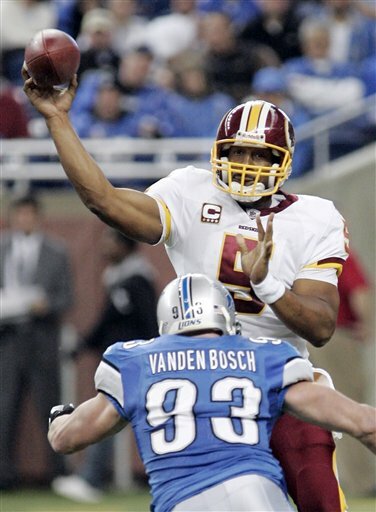 Vanden Bosch did not finish the Thanksgiving game and has not practiced since. Wide receiver Bryant Johnson is healthy, but inactive. It’s the second time in three games he has been benched. He was also inactive at Dallas. RB Jahvid Best (toe) and RT Gosder Cherilus (knee) are in. Best practiced three days this week but offensive coordinator Scott Linehan said on Friday that Maurice Morris would get the bulk of the work. Quarterbacks Matthew Stafford (shoulder) and Shaun Hill (finger) are out. QB Drew Stanton will start with rookie Zac Robinson backing him up. No third quarterback is designated. Since the Lions opened the season at Chicago, the teams have gone different ways. The Lions are 2-9, while the Bears have won four straight and are 8-3. Here are five things the Lions must do to have a chance of beating the Bears. 1. Run the ball. Jahvid Best practiced for three straight days this week which is an indication his turf toe is improving. That’s a good sign. If the Lions ever needed to run it’s this week. 2. The offensive line must protect Drew Stanton and give him plenty of time to get ride of the ball. It’s Stanton’s first start this season and just the second of his career. Naturally he needs a bit more time in the pocket. Also, if he goes down Zac Robinson goes in. Robinson can’t possibly know much about the offense since he joined the team on Nov. 9. 3. Get the ball to Calvin Johnson. 4. Rush Bears quarterback Jay Cutler early and often. The Lions will be without defensive end Kyle Vanden Bosch, but Lawrence Jackson has proven he’s a good pass rusher along with Cliff Avril. 5. Cornerback Alphonso Smith and the secondary must bounce back from the game in which Tom Brady gave thanks he was facing them. ALLEN PARK -- It’s a mostly healthy Lions team, if you don’t consider the top two quarterbacks and kicker are out of commission. Defensive end Kyle Vanden Bosch (neck) has not practiced all week and didn’t again today (Friday). He is not expected to play on Sunday. Right tackle Gosder Cherilus (knee) who sat out on Thursday was back in action today. Running back Jahvid Best, who has been bothered by turf toe all season, has practiced for three straight days which is unusual. He usually doesn’t practice until Fridays while he’s trying to rest his toe. Drew Stanton will start at quarterback on Sunday against the Bears at a sold-out Ford Field. 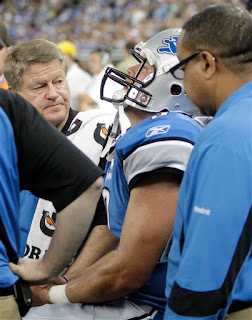 Matthew Stafford (knee) and Shaun Hill (finger) are out. The Kansas City Chiefs have filed tampering charges against the Detroit Lions according to a FOXSports.com report. Specifics are unknown, but FOXSports links the complaint to Lions defensive coordinator Gunther Cunningham, the former Chiefs coach. “(Kansas City) keeps wanting to dump their players. I would like to be there to catch a lot of them because I know a couple of those guys,” Cunningham said earlier this year. According to the report the charges may involve former Chiefs safety Jarrad Page, who was embroiled in a contentious holdout with the team earlier this year. Reportedly the Lions reportedly were interested in Page. ALLEN PARK -- Until this season, Lions kicker Jason Hanson had missed just one game in his 19-year career. After missing the last three games with an injury to the knee of his kicking leg, Hanson will be placed on injured reserve to end this season according to ESPN’s Adam Schefter. The 40-year-old Hanson, a two-time Pro Bowler, ranks first in every statistical category for a place kicker in Lions history. He was injured in the Nov. 7 game against the N.Y. Jets. Last week Hanson said he was a bit frustrated although the doctors seemed to think he was on track. At that time Hanson said it was the impact of kicking the ball that caused pain. Dave Rayner was signed to fill in. Rayner, who lives in Rochester and grew up in Oxford, kicked at Michigan State and has played for a number of NFL teams. In three games Rayner has been four of six on field goal attempts. ALLEN PARK -- For the second day Lions quarterback Drew Stanton took snaps with the starters at practice. It appears he will be the starter on Sunday against the Chicago Bears, but coach Jim Schwartz has not made an official announcement. Shaun Hill, who has the index finger of his right/throwing hand wrapped, was on the field today (Wednesday), but did not participate at all. Unsubstantiated reports are that his finger is broken and he’s done for the season. Hill also did not practice on Tuesday. Matthew Stafford (shoulder) was not seen during the media portion of practice, but he could have been in the training room. Defensive end Kyle Vanden Bosch did not practice for the second straight day. Running back Jahvid Best, who missed Tuesday’s practice, was back in action today. Kicker Jason Hanson (knee) was on the field, but was seen kicking a football.